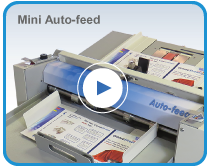 This is the next level of automation – making the CreaseStream Mini Auto-feed the easiest creaser to operate. Just set the tools, press the button and you’ll get up to 4,000 sheets of perfectly creased paper per hour.The Mini Auto-feed uses our unique sheet separator, which allows single sheets to be processed with unmatched accuracy and precision. It eliminates any trace of fibre cracking even with sensitively printed digital stocks. Minimum Size: 3.15" x 4.7"
Maximum Size: 20.4" x 20.4"
Range of Stock: 5-15 pt. Shipping Dimensions: 35" x 23" x 13"